Bo Burns (left) Marketing and Communications manager East Auckland Tourism with Charmaine Chapman chairperson of Howick Historical Village are working on exciting plans to make east Auckland a tourist destination. Times photo Wayne Martin. Bursting with exciting ideas and an action plan to work with tour operators, Bo Burns cannot wait to put east Auckland on the world map. 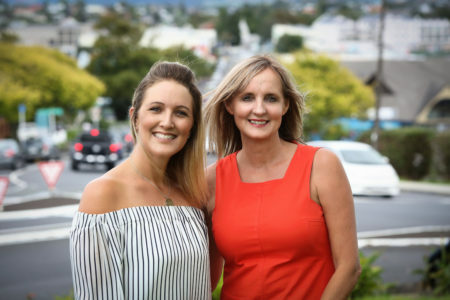 “Thanks to the Howick Local Board, Howick Tourism Inc. also known as East Auckland Tourism, we are proud to announce the appointment of our Marketing and Communications manager, a local women, Bo Burns who is commissioned to drive our newly setup tourism initiative and drive for East Auckland,” says Charmaine Chapman, chairperson Howick Historical Village. Bo has been a Howick resident and has always had a huge passion for the east Auckland, encouraging people to explore its beautiful and historical suburbs and local events. It’s only been three weeks since Bo was appointed as Marketing and Communications manager of Howick Tourism Inc and the go-getter has already worked on a Strategic Living Business Plan, Tourism Events and Economic Development (ATEED) Fund Report, membership proposal as well as a blueprint for the website and logo. As of last week, Howick Tourism Inc will also be known as East Auckland Tourism to incorporate the wider areas of Half Moon Bay, Pakuranga, Whitford, Beachlands, Maraetai and Clevedon. “It is far more beneficial to promote the whole area as a desirable destination. We have so much to offer and we will work with tour operators to bring people here from cruise liners,” says Bo who works closely with Ms Chapman. The action plan is for tourists at the Viaduct to hop on to a boat to Half Moon Bay where a dedicated van will be waiting to take people around. There will be different packages catering to people with varied interests with lots of tourists attractions like Howick Historical Village, Shamrock Cottage, Uxbridge Arts Centre, Stockade Hill, Howick Beach, Howick Farmers Market, Clevedon Market, Pakuranga Night Market, Botany Market, Mangemangeroa walkway, Half Moon Bay Marina, Rotary Walkway, Polish Heritage Museum, Zen Gardens, Ayrlies Garden, Fo Guang Shan Buddhist Temple and plenty of vineyards and scenic places to explore. “We will have a breakdown of activities for those interested in fitness or a family day out,” she says. Bo is keen to work closely with local retailers to promote their businesses whilst tapping into the tourism market. A small membership fee for businesses to be part of the website, social media promotions and ATEED workshops to understand the tourism market–will be charged. Right now, the East Auckland Tourism website is being updated to be a one-stop shop highlighting tourist attractions. The website will be launched mid-March with great fanfare. It will be celebrated with a special Family Day Out that will replicate an ideal day tourists can experience in east Auckland says Bo, who has got the ball rolling to make east Auckland as successful a tourist destination as Matakana and Waiheke Island. East Auckland Tourism will also involve local sports personalities, artists and celebrities to promote it to Aucklanders as well as overseas visitors on social media as a must-visit attraction.